An acoustic guitar lovers CD, flatpicked acoustic guitar music with passionate vocals, not just bluegrass, just great music. While that former Grateful Dead icon is a musical hero of Lambert, he is but one of many from all genres of music whose influence seeped into the nooks and crannies of Lambert's artistic fiber. Gram Parsons,The Allman Brothers, Lowell George, Bill Monroe, Flatt and Scruggs,Clarence White,Tony Rice and Doc Watson likewise have inspired his own creative output over the years. Lambert successfully filters bits and pieces of the disparate artists who inspired him into a sonic brew of eclectic and amazing music. Music lovers with broadband tastes will find much to enjoy in Lambert's enthusiastic approach, fueled by his genuine love and deep respect for all walks of traditional Americana music. title track is really an outstanding song, and Cumberland Blues is a cute witty song that I also like very much. As great as these songs are, it is the instrumental pieces that really blow me away. Ten instrumental pieces that captivate and hold you, envelop every second. The perfect mix of tempo, style and dynamics. Without vocals to hang your hat on, to do that for 10 tracks, all of them gems. I am amazed and inspired. You gotta check out this CD. Congratulations Eric. This is a truly outstanding CD. I just got finished listening to your new CD. I just popped it into the CD changer in my car...waiting to hear what I thought was just a demo CD for me to use to help book gigs in this area. I was VERY surprised (after talking with Dan) to find out you have a new CD. I called Dan,Doug,Leslie and said.."Do you know how "blanking" good this Eric Lambert CD is???!!!! Anyway, just want you to know i'm wearing it out in my CD player because it is my new favorite CD. I think you will find plenty of people interested in buying a few at Larry Fest and at the gig in June. Sometimes music flows from the CD to the heart and the effect is timeless. Eric Lambert’s guitar and mandolin music take the instruments into carefully crafted tapestries of sound. While the songs are mostly instrumentals, each one stands on its own with melodies that leave little dancing notes in your head. “Green” has a lovely Celtic lilt, and “Doin’ Alright” is a great vocal to sing along and pack with you on a gloomy day. “Leaves” is a gentle, flowing guitar piece with melodic passages that bring images of the great outdoors. His version of “Red Haired Boy” has great depth and melodic variations that jam session players would be happy to imitate. Eric has managed to make the recording immediate and intimate and the listener feels like the concert is presented right in the living room. I have been listening to your CD pretty much constantly ever since you sent it my way. It is such a pleasant mix of acoustic "Dawg-like" treatments of melodies, and the vocal selections are uplifting......I come away whistling and humming the tunes for the rest of my day ahead! Amazing, enchanting music. 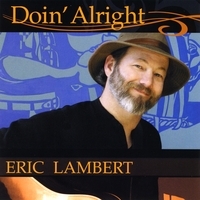 Doin' Alright is a masterpiece, Eric Lambert. Ten of twelve pieces are instrumental -- and I loved it! And that's coming from a wordsmith. Stopped by the Bone Dry to say thanks! I love your CD. Chris sang your song Doin' Alright to me and it made me cry. He said that's our wedding song. We will never forget how special you made our day!! I've listened to Doin'Alright four times through in less than 24 hours.I believe someday someone will do a CD in the spirit of Eric Lambert.